1. Choose a shape – box or otherwise. Keep in mind that it will be hollow and have a separate lid. 2. Limit the size of your box to 60mm by 60 mm on the bottom. Let’s the keep the height to under 80 mm. The walls of the box should be between 4 and 6mm thick. 3. Use a hole to make the inside space of the box. The hole can be the same shape as the outside or different. Example: the “box” can be round on the outside and square on the inside. 4. 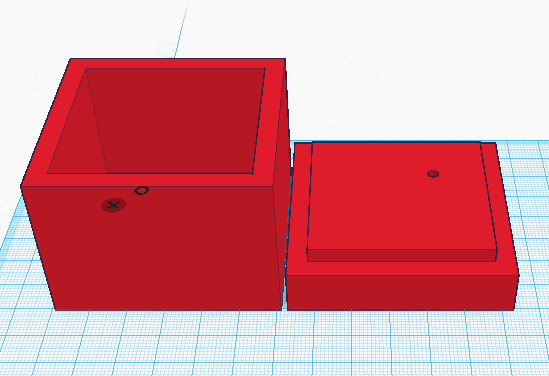 The lid: create a separate lid for your box. Arrange your lid so that is next to your box and flat on the workplane (that’s the gridded area). Ideas? Punch holes through your box parts – either the lid or side. Put a handle on the top. Create a fake keyhole and create a fake key to go with it. 1. make sure that your design is public in tinkercad. Go to design, properties and switch to public. 2. give your design an understandable name like “Rod’s keychain”. No more “staggering bumbo”. To submit your final design for printing just follow this link.